The Bruins have won their last 5 games. They are 5-0-0 against the Southeast this year. The Capitals have been unreal in their own building, going 10-1-1. The loss was to the Panthers and the shootout loss was to the Devils. They're clicking at 27.1% on the powerplay at home. Yikes. The Bruins have worked their way up to having the 10th best PK overall this year. They started at 30th with an abysmal 70% kill ratio. The PP stays steady at 4th. The Washington Capitals owner, Ted Leonsis, has a blog. I'd send him the 5 questions, but my guess is that he's pretty busy running his media empire and I really should have sent that days ago. A lot of good guys on washington are hurt, namely their whole defense, last I checked. After Stephane Yelle collided with Mark Shewchyk, Sobotka got called up to fill in. I like his energy, this isn't the worst thing that could happen. The Caps are top-secret about their morning skate. Johnson in net. Manny in net. Sturm and Ward are out. Yelle or Sobotka is a game-time decision. Kessel has scored a point in the last 12 and a goal in the last 6. Unreal. Krejci also has a point in the last 9 games. The Spoked B looks at how well the Bruins are starting vs. the best 5 Bruins seasons since expansion. The 29-30 Bruins scoff at playing against 6 teams. The 2 Man Advantage's Scotty (I think) gives us a stream-of-consciousness report on Hockey. Kathryn Tappen has now made the Julien/Belichick comparison. Bruins fans think Brashear/Thornton is likely, Caps fans want Lucic/Brashear. Except for one on Japer's Rink, who wants Ovechkin to run Lucic. Whatever. 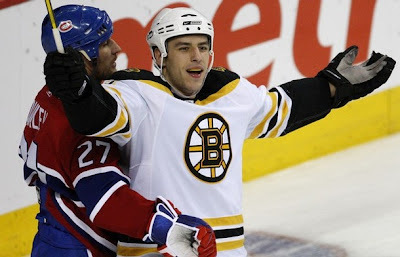 We've seen how the "enforcer wants to fight Lucic" story works out. This picture should have a goal horn to go with it. Kynch's Korner: "After having a scare thrown into them by Tampa, no way they come out with anything less than max effort." Here Comes the Bruins! : "the Bruins PK unit would be shaken up slightly against the conference's third-best PP unit... which could have a significant effect on the outcome of this important game." Stanley Cup of Chowder: "I have a confession to make: I have a soft spot for the Washington Capitals." I just like OvieTime, myself. Japer's Rink: "...the boys in red have more than a puncher's chance given how well they play at home, and the simple fact that they have Alex Ovechkin and Boston doesn't. Edge: Washington." The Bear Cave: Looking back to Washington's last game on Sunday, the Capitals had a whopping total of nine players out of the lineup due to injury. That doesn't include Brian Pothier, who has been out indefinitely since the beginning of the season. NESN First Shift: "Expect Johnson to get the call against the Bruins."